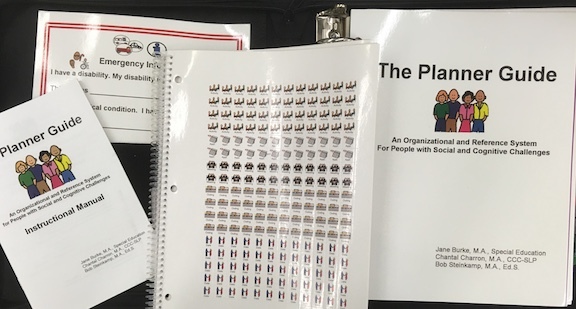 The Planner Guide is a visual (text and graphics), color-coded organizational system containing reference guides to provide information, instruction and direction for various situations. The contents of this book can be used as a curriculum for learning for younger years, adolescence, adult life and then ongoing as a life long reference tool! Use The Planner Guide to "connect the dots of life for organization, stress management, relationships, problem solving, self-advocacy, communication, personal safety, independence, and interdependence. Use the Planner Guide for: Educational Curriculum, Therapy, Support Groups, Individuals, Social Skills Curriculum and Lifetime Reference. Contents of Kit: three ring binder; event stickers; 141 reference guides; 56 wallet cards; wallet card organizer; wallet card holder; document pouch; instruction guide. (You will have to provide your own yearly calendar).